Do you currently use Patient Portal software? Patient portal software is quickly becoming a necessity in medical practices across the United States. As broadband Internet connections and smartphones become ubiquitous, more patients are using the Web to seek out care and health information. According to a 2014 survey from Medscape, 80 percent of physicians now use electronic health records systems. Aside from the operational efficiency that a well-implemented EHR can deliver, most EHR vendors also offer patient portals. However, according to a recent study conducted by TechnologyAdvice, “almost 40 percent of patients are unsure if their primary care physician has such a system in place,” suggesting that many physicians have not adopted a patient portal. Inspection of the quarterly reports on the Meaningful Use Incentive Program released by CMS indicates this as well. A patient portal is a requirement for successful attestation for Stage 2 of the incentive program, and less than 1.5 percent of physicians and organizations who attested for Stage 1 have successfully attested for Stage 2. In order to comply with HIPAA regulations, all patient portal vendors must provide restricted access to protected health information using a secure username and password for each user. Which Patient Portal software is right for your practice? The proliferation of healthcare IT vendors means that providers have numerous medical software options. Most of the systems developed are, due to incentives, EHRs, but many of these systems include an integrated patient portal. There are many advantages to selecting an EHR with pre-integrated peripherals such as a patient portal or practice management system. These include increased efficiency and less need for costly custom development to build a bridge between systems. However, there can be drawbacks. 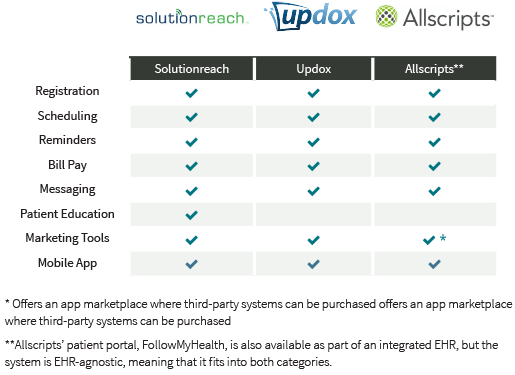 Many all-in-one systems lack non-incentivized, but no less important, features like online bill pay, online patient registration, and patient scheduling. As healthcare IT vendors struggle to gain ONC certification for Stage 2 of the Meaningful Use Incentive Program, many are turning to a modular software delivery model. Some are even enlisting third-party software providers to provide patient portal functionality for their tools. This modular design allows them to charge an additional fee for providing a patient portal, but paying more for a system with all the functionality desired is usually preferable to using a pieced-together patient portal that satisfies only the minimum, “view, download, transmit” requirements of MU Stage 2. Healthcare IT rating agency KLAS recently selected athenahealth’s athenaCommunicator as the #1 patient portal, with a score of 91.8 on the most recent Best in KLAS awards . athenahealth’s suite was also ranked #2 overall for practice sizes from 1-75 physicians. Even though it is part of an integrated system, athenaCommunicator includes many of the more innovative features outlined above, including online scheduling, bill pay, appointment reminders, and even a smartphone application which allows patients access to their health information. 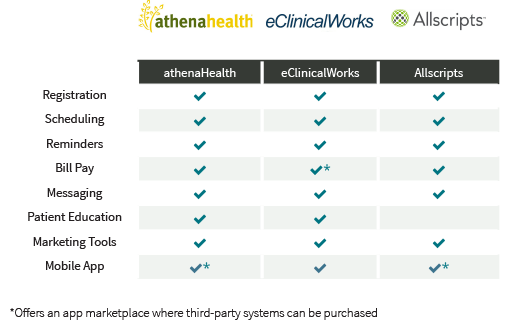 To date, over 59,000 providers have adopted the athenahealth medical software suite. Provider frustration with many pre-integrated, non-user friendly systems has led to the development of standalone patient portals. Standalone systems usually include more features and do not rely on sunk costs to keep their contracts. Additionally, third-party vendors are often more attentive to detail and offer a better user experience, but they are not without limitations. While third-party patient portal vendors are incentivized to create bridges that will allow their systems to integrate with a wide variety of EHRs, it can be difficult to build a bridge for a system whose vendor refuses to cooperate. This can limit both users’ choice and efficient care coordination. If your practice uses one of these systems, your patient portal options may be limited. Solutionreach began as Smile Reminder, an automated appointment reminder service for dentists. In 2011, they rebranded as Solutionreach, and began offering their cloud-based system to a variety of businesses seeking better engagement with their customers. Solutionreach includes a host of other features including online scheduling, email marketing, social media integration, patient education tools, and even a mobile app that can provide patients with directions to their appointment. It also integrates with a wide variety of systems, making it easy to deploy at almost any provider’s office. Many electronic health records and patient portal software vendors are suffering attrition due to failures to certify their products for Stage 2 of Meaningful Use. This is leading to general consolidation in the healthcare IT market. Currently, the top few vendors control approximately 75 percent of the marketplace, and that trend is expected to continue. However, consolidation does not mean that innovation will cease. Hundreds of startup healthcare IT vendors are seemingly born each day, thanks in part to entrepreneurship initiatives at technology incubators and even large hospital groups. The rise of e-patients and their affinity for health wearable devices such as Jawbone or Fitbit will likely signal a corresponding rise in patient engagement. Physicians and healthcare IT vendors that move to leverage the vast amounts of data being captured by these devices will be on the forefront of preventative health and population health modeling. It is a trend that we are keeping a close eye on here at TechnologyAdvice; a recent survey we performed indicated that while these devices are not currently seeing widespread use, nearly 60 percent of patients surveyed indicated they would use such a device if it would save them money on health insurance premiums. In a world where consumers want access to everything online, a patient portal is fast becoming a necessity. Physicians who implement one stand to benefit in several ways, including reduced no-shows, shorter collection times, more engaged patients, and ultimately better care outcomes. The options available are extensive, but our Technology Advisors are here to help. Call, click, or email today for a free consultation on which patient portal best fits the unique needs of your practice.